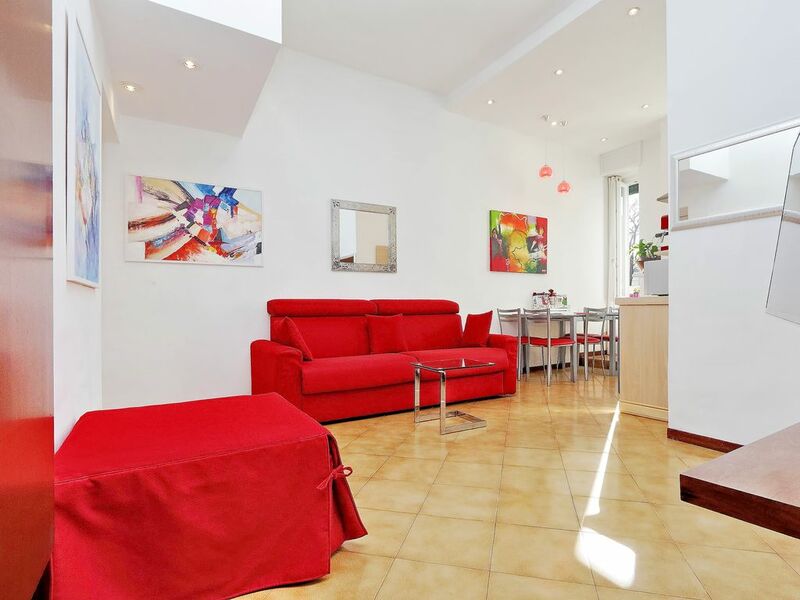 Bright and modern apartment located in ancient Rome, neighborhood of Trastevere. Is one of the most beautiful areas of Rome and known to the world, the district is able to describe what the best way of being and sense of belonging that popular locals call 'Roman' and above all to fall in love with everyone who visits. The apartment is on the first floor , recently renovated with high quality furnishings. Composed of a furnished living room with a comfortable double sofa bed (King size) and a single sofa bed, fully equipped open kitchen with oven, and a bedroom with King size double bed, a large walk-in wardrobe, a bathroom with shower. The apartment is endowed of every comforts::washing machine, 2 air conditioned, independent heat, 2 televisions(LCD), SAT-TV, DVD,phone line ,internet access,Wi-Fi, and a security box, hair dryer, iron and ironing board, + a baby cot(upon request) and Airport transport upon demand. "A small appartment, one bedroom with a double and a 3 sofabeds in the living room. Nice big storage room. Nicely renovated, old building but all modern inside and kitched equipment complete. Also lots of touristic reading avail. Easy to reach by train and to take tram to city center. all arrangments with Gianmarco went very smooth. Would recommend to stay here." "We found the apartment to be exactly as described on the Homelidays website. It was spotlessly clean and tidy. Its accommodations met our needs exactly and its location was perfect as a starting point for touring Rome. On top of that we found the Grifa family to be most friendly and helpful and we extend a huge "Thank you" to them for this." "The accomodation was exactly as described. The owner organised transport as we arrived at about midnight. We were also shown around the flat at that time on a Sunday night, thank you. There was plenty of coffee etc. for breakfast for the whole stay. Transport into the centre was a few minutes walk and the trams appeared quite regularly. There is a fresh fruit and vegetable market outside every day, so you didn't have far to go for milk etc. in the morning. We had a very pleasant stay and would recommend the accomodation to anyone." "We were generally very happy with the standard of accommodation provided. Whilst the apartment location is very convenient to buses and trams, it is not as close to the historical centre of Rome as we originally believed, ie one must take the public transport into the centre and not walk." "Appartamento ben arredato ed attrezzato, comodo anche per 4 persone. Nelle immediate vicinanze c''è la stazione di Trastevere da cui partono gli autobus per il centro. E sotto casa il bar che sforna ottimi maritozzi." "Ubicaciòn perfecta por la facilidad de comuninaciòn con los lugares màs emblemèticos de Roma;equipamiento impecable,informaciòn del propietario a travès de un book muy ùtil....Absolutamente recomendable." From "Leonardo Da Vinci" Airport (Fiumicino), it’s possible to take the subway that goes to the "Trastevere Station" and from there you can walk to the apartment in a few minutes. The apartment is located in a corner of Trastevere area a very quiet and safe at night. Trastevere has an ancient history that extends all the way back to ancient Rome. The area is so gorgeous that many famous and prominent people have built homes there, including Julius Caesar's garden villa Horti Caesaris. Much of its construction occurred in the Middle Ages, including the expansion of its narrow streets to make room for carriages. The area still has the feel of a medieval town, which is what gives it character and appeal to visitors. Walking through the alleys of Trastevere, one is struck by the magic that runs through the streets and fully understand the meaning of "Eternal City". Rome grows, expands, but continues to maintain a heart and pride inherited from 'ancient Rome. All places of tourist interest are within a short walk,Colosseo, Piazza Venezia, Campidoglio, Foro Romano, Piazza del Popolo ,Circo Massimo,Fori Imperiali, Campo de’ Fiori, , the Pantheon, , Piazza Navona ,St.Peter Vatican. The position is strategic to reach any attraction in a very small time and very well connected by public transport. The apartment, completely renovated and decorated to offer the best hospitality in an elegant and eye for detail. Its strategic location makes it ideal for a comfortable and enjoyable holidays. The Trastevere is known for delicious food and some of the best restaurants in Rome. The La Fraschetta is considered to have the best gnocchi in town and offers customers four different sauces to go with the gnocchi.